There are more than one artist/artists with the name Fatboy 1. 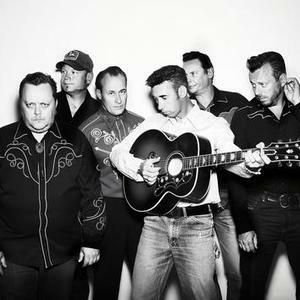 Fatboy is a swedish Alternative/ Rockabilly / Country group. Fatboy is Thomas Pareigis, Hannu Kiviaho, Alf ostlund , Jan Lissnils, Joakim Lindahl and Jorgen Wallreleased. It is best described as Tight Slapbass Rock-a-billy mixed with old school country and finnish folklore. Their latest album "In My Bones" was released on the 24th September, 2008. 1. Fatboy is a swedish Alternative/ Rockabilly / Country group. Fatboy is Thomas Pareigis, Hannu Kiviaho, Alf ostlund , Jan Lissnils, Joakim Lindahl and Jorgen Wallreleased. It is best described as Tight Slapbass Rock-a-billy mixed with old school country and finnish folklore. Their latest album "In My Bones" was released on the 24th September, 2008. 2. Fatboy (Vladan Aliba?i?) was born in 1977 in Serbia. He developed his musical tastes listening to music on the radio & TV back in the 80's and the 90's. Music played a big part in his early life, as he found it to be the easiest form of expression. After managing to buy his first set of decks, he never looked back. In the beginning, he experimented with a deeper funky-house style, along with some rare retro-electro tunes, and other stuff that wasn't usually played at the local club. In year 2003 Fatboy spent six months playing at 'Ku-Bu' club/lounge in Dubai along with resident DJ Paul (UK). His passion for music went a lot further than just spinning tunes. In 2005 Fatboy started his now widely recognized 'CLUBNIGHT' show on 'ONEWAY 88.8FM' DJ radio (www.oneway.co.yu) in Vr?ac. Clubnight focused on showcasing a diverse range of underground house, techno and other forms of electronic music and strived to promote DJ scene and clubbing by hosting live sets and interviews from country's top DJs and producers. He also writes articles and reviews for ?Urban Bug? magazine and ?Rush? e-zine. The tunes Fatboy plays can be very diverse: you can expect to hear anything from Chicago & San Francisco chunky-funky & jazzy house rhythms to deep house sub-grooves with funky, electro and dubby elements.